Identity, Activism, and… the Armor of God? I’ve been thinking/writing a lot about identity and activism lately, so you probably won’t be surprised to hear that I am circling back to those topics again! I just finished preaching through the book of Ephesians at River City, and the passage that really got a hold of me in a fresh way was the conclusion of the letter. Here the Apostle Paul both summarizes the major themes of the book and gives a final charge/benediction to the Christ followers in Ephesus. He reminds them that the ultimate battle is not against flesh and blood, but instead is against principalities and powers of darkness. He then develops imagery based off of the Roman military culture to give them something practical by which to understand and engage in this battle. I grew up around church, so this is not an unfamiliar text. In fact, it’s a Sunday school lesson that I have quite vivid memories of. I can still picture the felt board where our teacher would re-tell Bible stories while magically sticking the cloth characters in their imaginary places. 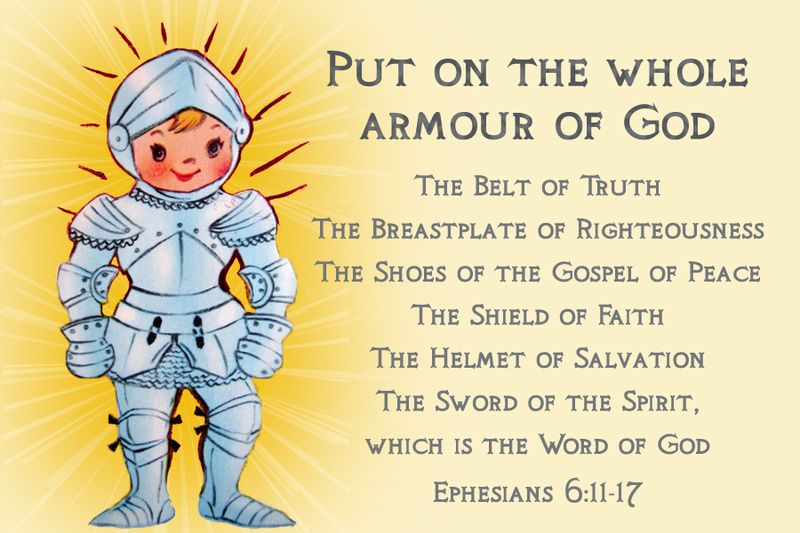 The felt board thing often had a way of taking away from the reality of the story for me, even as a youngster, and I remember the Armor of God being one of the most cheesy of all (the picture above gets pretty close to how I thought of this story back then). I think it’s already difficult enough for children to understand a challenging passage like this (what is an 8 year old supposed to do with the fact that the Bible says there is a supernatural battle happening between Jesus and the devil?) But then you start throwing up felt pictures of 1st century weapons of destruction? Helmets, shields, arrows? The whole thing seemed kind of crazy. I had more fun pretending I was Luke Skywalker with my “sword of the Spirit” than trying to interpret what it meant to wear the helmet of salvation at school on Monday. And then as I got older I learned of the many harmful ways that warfare language had been used by Christians throughout the centuries. Even today, the Christian “culture wars” strike me quite often as bizarre and misguided. It seems that the things Christians fight against/for today don’t always match up very well with the things that Jesus did. So even though I think of myself as having a bit of a warrior spirit, I tend to shy away from anything that comes across as too militant or crusader-like. In 15+ years of preaching, I have never given a message on this text. I admit that the reasons above are probably part of the reason why. Therefore I approached the passage this time with a fresh sense of enthusiasm. I really love the book of Ephesians, and it’s done a lot to help clarify some of the deep themes of Christianity for me. I figured that the reason this particular text had failed to make an impact had to do more with me than with the actual meaning Paul was trying to convey. Therefore I spent twice the amount of typical prep time on studying and reflection, and it really paid off. In fact, that’s one of the things that I’ve come to really enjoy about the Bible over the years. I think it’s pretty cool that a text can seem confusing or even irrelevant in one era of life, and then it can come to be filled with so much meaning in a later era. This text is quickly becoming one of those for me. The more I studied Ephesians 6.10-20, the more I also saw a parallel with John 10.10 (the theme verse for my upcoming book). In John 10.10 Jesus says that he has come to bring fullness of life, but he also warns that the road towards life is not without danger. There is a thief that lurks in the background, hoping to steal, kill, and destroy that fullness of life. In the same vein, the conclusion of Ephesians is showing us what it means to be connected to Jesus, to combat that evil one, and to experience the full dimension of life in Christ. I realized that this is a fantastic passage for deepening my/our understanding of not only fullness of life and the presence of evil, but also these same themes of Identity and Activism. So over the next few posts I’ll share some of the themes that have really jumped out to me in a powerful way. Here is the passage in full. Happy Monday! On a serious note, I always look forward to your blog posts in my WordPress Reader!